Seeking to advance minimally invasive medical treatments, researchers from University of Houston and Harvard Medical School have proposed using millibots, driven by magnetic potential energy from magnetic resonance imaging (MRI) scanners. The researchers described the work in a paper presented this week during ICRA, the conference of the IEEE Robotics and Automation Society. The team state that the technology could be used to treat hydrocephalus and other conditions, allowing surgeons to avoid current treatments that require cutting through the skull to implant pressure-relieving shunts. They have already completed proof-of-concept trials for components and actions. Their paper, ‘Toward Tissue Penetration by MRI-powered Millirobots Using a Self-Assembled Gauss Gun,’ was nominated for best conference paper and best medical robotics paper. The paper details a technique for generating large impulsive forces that can be used to penetrate tissue, an approach based on sending tiny maneuverable robotic components to a desired location and triggering the conversion of magnetic potential energy into enough kinetic energy to penetrate tissue. The researchers explain that hydrocephalus, among other conditions, is a candidate for correction by their millirobots because the ventricles are fluid-filled and connect to the spinal canal. They go on to add that their noninvasive approach would eventually require simply a hypodermic needle or lumbar puncture to introduce the components into the spinal canal, and the components could be steered out of the body afterwards. Using a MRI scanner, the researchers mapped routes on high-quality brain images, hacking the scanner to harness the MRI’s own magnetic fields to push the small robots. The team demonstrated use of magnetic forces to activate needle-biopsy robots and to walk robots around an MRI. 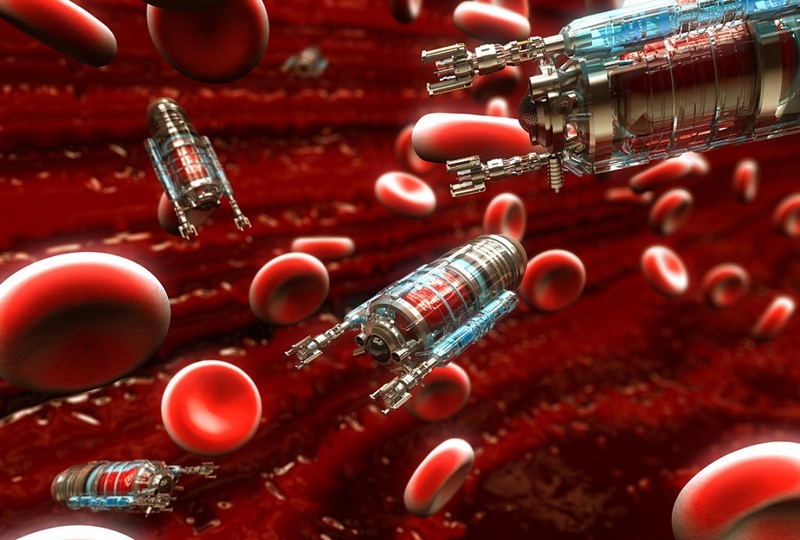 The approach proposed by the lab involves navigating individual millirobots to a target location and allowing them to self-assemble in a manner that focuses the stored magnetic potential energy as kinetic energy for tissue penetration. The team note that MRI scanners alone don’t produce enough force to pierce tissues or insert needles, so the they have drawn upon the principles behind a toy called a Gauss gun, which relies upon a row of steel balls separated by several high-powered magnets, to amplify the force. The researchers explain that a Gauss gun employs a single steel ball rolled toward one end which then sets off a chain reaction when it smashes into the next, with the sequence repeated until the last ball flies forward, moving much more quickly the initial ball. Similarly, in the current study the medical robot is a barrel self-assembled from smaller components that can navigate easily through the body. Each component is 3D-printed from high-impact plastic, with slender titanium rod spacers separating two steel balls. Magnets aren’t needed, because the balls are magnetized by the MRI scanner. The team state that in proof-of-concept studies they have demonstrated the procedure working on plastic, fluid-filled containers, or phantoms, inside an unmodified clinical MRI scanner. The researchers can now create clinically relevant forces inside a standard MRI scanner, using just the MRI magnetic field. Future work will now focus on exploring clinical context, miniaturizing the device and optimizing material selection.